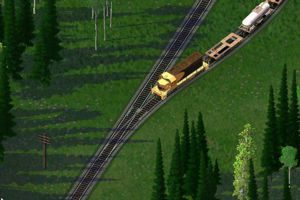 Single Track Rail, or as it is usually called STR, is a SimCity 4 project, like the Rural Highways (RHW), that represents completely new transit network content added to the game. The Maxis Railways are double tracked, one-way in each direction, that occupy when oriented orthogonally most of a whole grid square from side to side. STR reduces this to a single bi-directional track centered in the grid square. While "eye candy" (in other words, non-functional) STR had been around for several years, mostly produced by Japanese custom content makers and a Simtropolis member Dirk (North Country Dude), it wasn't until 2008 that SimCity 4 Devotion member David (dedgren) proposed, in connection with a set of wide radius game rail curves he was developing at the time, a switch leading off onto a functional single track. This idea remained dormant, however, until SC4D members Jonathan (Warrior) and Dave (bighead99) began to collaborate in September 2008 on full-up STR concept development. They had made substantial progress developing textures and doing transit modding when they first published their work on the SC4D's Railroad Addon Mod (RAM) Team members private thread. dedgren, who was not aware of their efforts prior to that point, quickly joined them and began developing wide radius STR curves and switches. North Country Dude and Matt (threestooges) joined the effort in October 2008, and development began to spread out beyond just STR into the areas of railyards, three and four-track rail lines and other ground-breaking concepts. Nardo69 joined the STR working group in November and Jan (Swamper77) is providing modding assistance with ancillary content such as Type21-based signals. The STR takes four very well explored modding areas and puts them together in a novel way. These areas are transit texture development, puzzle piece creation, pathing and draggable transit overrides. The unique look of STR is due to the transit textures, which are drawn incorporating far more real-life detail, such as switch frogs and uniformly-spaced ties, than are seen in the game dual-rail equivalents. The adoption of dedgren's wide radius curves adds to the realistic appearance. All the rest is simply modding- time consuming and difficult, but hardly cutting-edge. This accounts for the relatively short time between the work done by Warrior and bighead99 in the late summer of 2008 to the first full-blown STR release with the newest NAM update. This page was last modified on 1 July 2009, at 17:42. This page has been accessed 16,142 times.